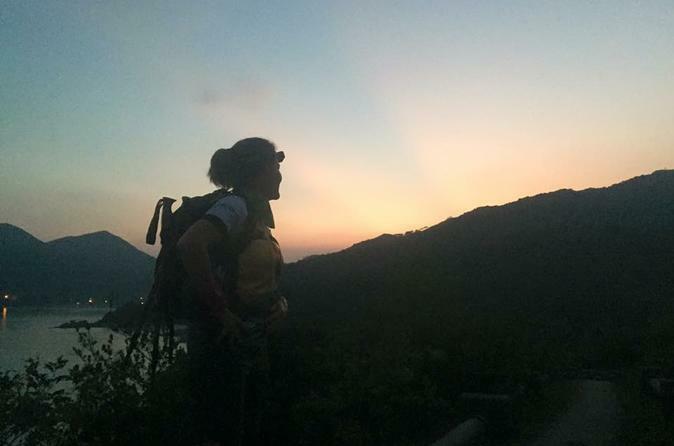 Watch Hong Kong’s glittering lights give way to a mountain sunrise on an 8-hour, overnight hiking trip to Lantau Peak. Set out in the dark and hike beneath the moon and stars, then sip hot drinks on the summit as the sun appears over the South China Sea. Experience a once-in-a-lifetime dawn from the second-highest peak in the Hong Kong territories. Meet your guide at a centrally located meeting point and start your nighttime venture with a scenic ferry ride from Hong Kong. After arriving on Lantau Island, leave the village of Mui Wo, and begin the steady climb to Nam Shan, where you’ll break before the final ascent. Watch for local wildlife along the side of the trail, as porcupines, boar and the rare barking deer can be seen in this remote location. Spot the constellations and planets as they cross the sky above the mountain, and tick off landmarks as you continue to ascend past the Halfway House Pavilion and Heaven’s Gate. At the 3064-foot (934-meter) summit, take a well-deserved break over coffee and tea, and find a comfortable place to watch the sun come up over the water. When dawn has fully broken, make your way back down the trail to hop a bus to Mui Wo and the return ferry to Central, then get tips on the perfect place to find a Hong Kong breakfast.